Updated articles and new products for your 2018 tax return will be posted here as I roll them out! The First Step to Complete Your Grad Student Tax Return (2018): A video detailing what tax forms you can expect to receive (or not receive) during tax time and how to process your income numbers before you enter them into your tax return, plug them into tax software, or pass them to your tax preparer. How to Prepare Your Grad Student Tax Return (Tax Year 2018): A full, detailed, and step-by-step explanation of how grad students should prepare their tax returns, covering the various income types a grad student receives and the education benefits available. The Complete Guide to Quarterly Estimated Tax for Fellowship Recipients: A long-form article explaining everything from what estimated tax is and who has to pay it to how to calculate your payment to how to make your payment. Do I Owe Income Tax on My Fellowship? : A short podcast episode explaining how fellows, both graduate students and non-students, know whether their fellowship income is taxable. Weird Tax Situations for Fellowship Recipients: An article for fellowship recipients (grad students and non-students) on the unusual effects fellowship income has on your taxes. Weird Tax Situations for Fully Funded Grad Students: An article for funded graduate students on the unexpected effects a ‘student’ status has on your taxes. Form 1098-T: Still Causing Trouble for Funded Graduate Students: Form 1098-T was revamped between 2017 and 2018, which will be a great improvement in 2019 and following. For many funded graduate students, 2018 is a troublesome year with respect to their 1098-T numbers. Where to Find Completely Free Help on Your Tax Return: An annotated list of 100% free sources of information and assistance in preparing your tax return. The IRS offers multiple forms of help, and there are also other online and community resources available. 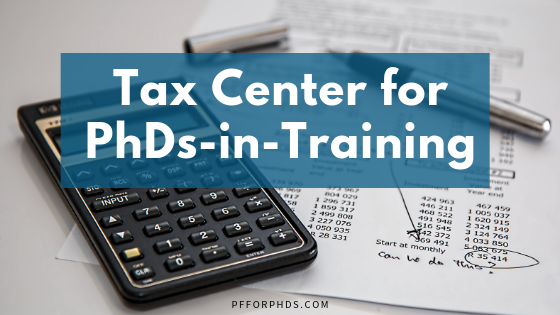 Where to Report Your PhD Trainee Income on Your Tax Return: A detailed list of which lines on your tax return you should report W-2 (compensatory) and non-W-2 (non-compensatory) PhD-related income. Covers Forms 1040, 1040NR, and 1040NR-EZ. Fellowship Income Can Trigger the Kiddie Tax: Young graduate students (under age 24) who receive fellowship income may be subject to the Kiddie Tax. The Kiddie Tax rate is calculated from the rates used for estates and trusts instead of ordinary income, so a fellowship recipient may easily pay a 37% tax rate on the last dollar of income instead of (typically) 12%. This article explains who the Kiddie Tax applies to and how to calculate it. Graduate students, you have to do some number-crunching with your higher education-related income and expenses before you start preparing your tax return to get an accurate tax return and minimized tax burden. I created a workshop to help you with that! Graduate students, if you need some help with that very last mile of how to enter your higher education income and expenses into TurboTax®, purchase my PDF guide. It’s largely annotated screenshots, organized by the type of form (or lack of form) you received.